You gotta join us live for our next Live Webinar, totally free of charge. Not only will you learn terrific techniques, but if you tune in live, you can be entered to win excellent prizes to help you in your work. (Note: MUST BE TUNED IN LIVE TO WIN). We kick off Wednesday, September 13th at 1:00 pm Eastern, 12:00 pm Central, 11:00 am Mountain, and 10:00 am Pacific. 2 pm in the Virgin Islands. 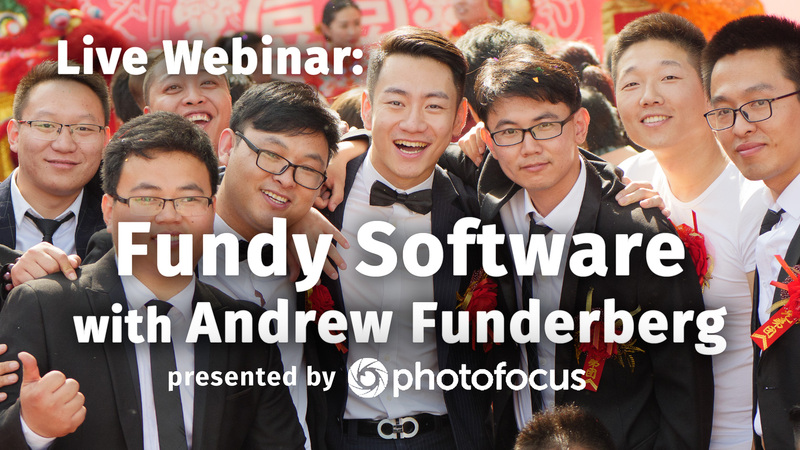 Fundy Software is one of the greatest tools for photographers who want to present their work, and in this webinar company founder, Andrew Funderburg will introduce you to this powerful tool. He’ll show you how easy it is to make all kinds of print products from albums to canvas groups, and he’ll show you how Fundy makes you into a great designer without a degree in design. You’ll quickly understand why all the pro’s use this marvelous tool to make their work look its best. This webinar is brought to you by Photofocus.com where you’ll find education and inspiration for every level of photographer and videographer. This episode will be useful for all levels of photographers from beginner to advanced. Tune in Live to enter the drawing for some terrific prizes from our sponsors. While you’re waiting for this month’s Lightroom Live, why not catch the replay of last month’s Lightroom Live Episode with Lisa Robinson–it was all about weddings, and Fundy Software is perfect for wedding photographers.